stay in prison for Chourik (551 rubles) + fifteen hours of work for the commissar (255 rubles), including lost wages for Chourik due to temporary lay-off (675 rubles)—this episode cost the Soviet state a total of 1,538 rubles. 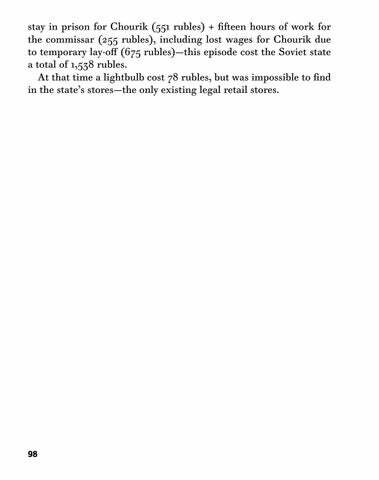 At that time a lightbulb cost 78 rubles, but was impossible to find in the state’s stores—the only existing legal retail stores. THE SUPERIORITY OF LENINISM OVER TSARISM During the First World War, a young Austrian lieutenant, Emerich Poglitsch, had been taken prisoner by the army of the tsar. By 1947, he had become a councilman in Vienna—occupied at that time by the Russians—and once again found himself in a Russian prison. It would be difficult to suspect Emerich of sympathies towards Marxism-Leninism. He was integrity personified. Yet, he had to admit that there was one point on which the Soviet camps could be said to have improved upon those of the old tsarist regime, and that was that you were no longer devoured by lice.